This line connects Leningradskiy Prospekt with large districts: Tushino, Strogino, Shchukino in the north-west of Moscow. 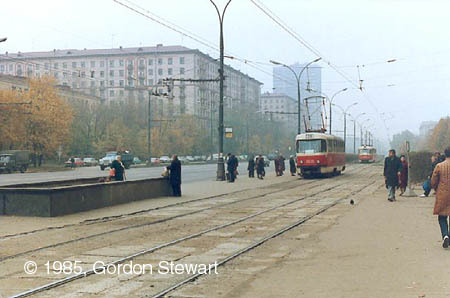 The first tramline here (a single-track line to Pokrovskoe-Streshnevo village in Moscow suburbs - now deep inside Moscow borders) was constructed in 1922. 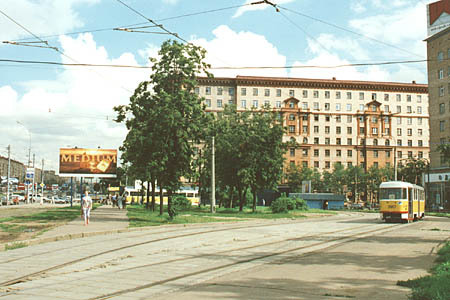 A two-track terminus at a junction of Alabyana Street with Leningradskiy Prospekt. 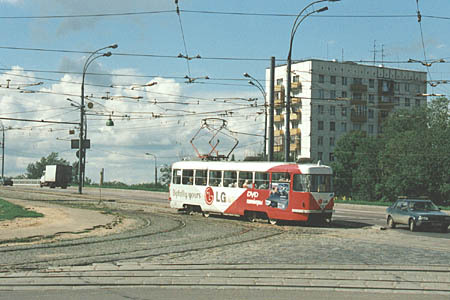 This terminus was opened on August 10, 1979 as a replacement for another terminus in Marina Raskova Square, closer to the city centre. A square at the junction of Leningradskoye Shosse and Volokolamskoye Shosse, with a track branching to the right that leads to the terminus. 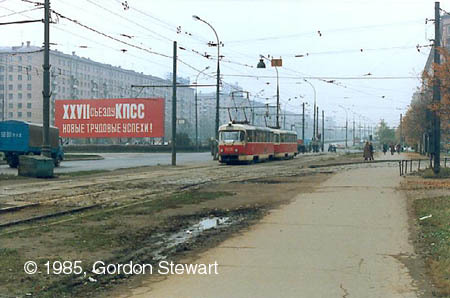 Note the red placard proclaiming the 27th Congress of the Communist Party of the Soviet Union; no such 'advertisements' can be found today in the streets of Moscow, of course! Tramstop Institut Ghidroproekt, looking to the west. The tracks here run on a separate alignment along the highway. Volokolamskoye Shosse. 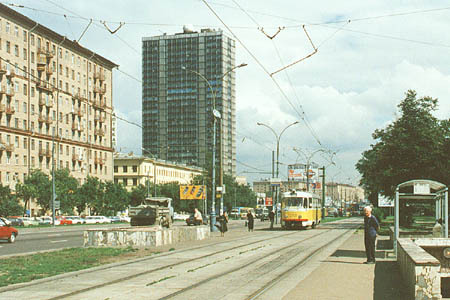 The high tower in the centre of this photo marks the place where Leningradskiy Prospekt splits into Leningradskoye Shosse (it does not have a tramline today) and Volokolamskoye Shosse. Ulitsa Panfilova stop is the last one on this span of the line. 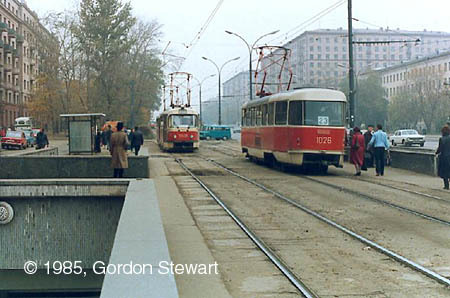 Further tram tracks diverge from the main road and have their own way; one tram branch (to Tushino district) returns to Volokolamskoye Shosse a few stops before crossing the Moskva-Volga canal, while the other line leads to huge Strogino residential zone. The tracks climb up approaching an overpass over the Moscow Ring Railway. This line crosses Pokrovskoye-Streshnevo forest en route to Strogino and Tushino; and the tracks to the left lead to Konstantina Tsareva Street. Photos by Gordon Stewart are used with permission.